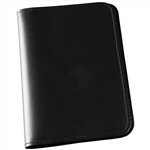 Like a wallet for your notebook, the black full grain leather covers fit one notebook each. The leather is strong and sturdy, yet flexible enough for your pocket. Use the No. 34 to cover the No. 393-M Mini-Spiral Memo Journal or any Mini-Stapled Notebook.